You know I love to read! Summer reading as an adult is way more fun than it was when we were in school. Today I want to share the books I am really excited for this summer aka my summer 2018 reading list. If you know me at all you know I am a huge Colleen Hoover fan. I was lucky to receive and ARC of All Your Perfects (full review coming soon). I can tell you it’s amazing. I have a more in depth review coming closer to it’s release but I promise you it’s her best yet! Tell Me Lies was a really different book than anything I had read before. It alternates points of view of the two main characters and really delves deep into their relationship. I love Emily Giffin (we have met!) and when I saw she was releasing a new book I could not wait to get my hands on it. This one is a bit different and I love that. It’s less love story and more people story. You will love All We Ever Wanted. I know in life we aren’t supposed to judge a book by it’s cover, but this book had me at the title. I mean When Life Gives You Lululemons is a great title. Then I found out it was a sequel(ish) to The Devil Wears Prada. It’s more of Emily’s story years later. It is SO GOOD! I think I even liked it better. Y’all I love Sophie Kinsella’s books! I was so pumped to realize she released a new one in February! Surprise Me, was super cute! Anyone who is married or in a long-term relationship will LOVE this! I Don’t Know How She Does it is one of my favorite books so I was thrilled to see the author had a new book, How Hard Can It Be coming out. It’s a sequel so make sure you read the first one first! Other Peoples Houses was sent to me as an advanced copy and you guys it was so good. I could not put it down. When a carpool mom witnesses something she shouldn’t she decides to not do anything about it but then everything just comes crashing down. So good! 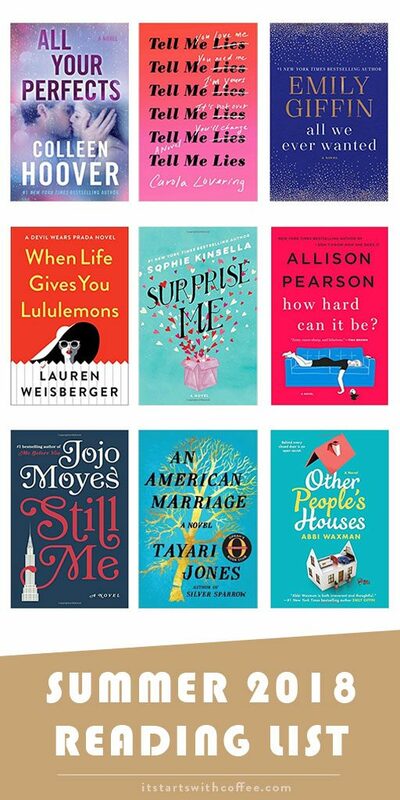 An American Marriage was an Oprah Book Club selection so duh I’m in! It really broke my heart. This seemingly perfect couple is thrown when the husband is arrested for a crime the wife believes he did not commit. She then finds comfort in another man. His best man! I was SOOOO excited for another book about Louisa and Still Me is such a good chapter in her story! If you loved Me Before You and After You, I think you’ll like this. In fact this may be my favorite so far! What’s on your summer 2018 reading list? If you are interested in any of these books check out below to shop them! I haven’t got a reading list – I’m pretty spontaneous with my reading and I believe books come to us not the other way round. But When life gives you lululemons intrigues me. Thanks for the recommendations! Most of these books look like they’re a light and easy read…perfect for summer! I have to say, you have piqued my interest! I will be sharing this list with my daughter too! Its been a while since I’ve read for fun. I’ve been thinking of dusting off my library card this summer and these look like some great suggestions to start with. Thanks for all the book ideas! I have some travel coming up and these look like great vacation reads! I’ve been really into historical biographies lately so I’ll probably read a few more of them this summer. I just finished a really good one on Leonardo da Vinci and am in the middle of another one on Catherine the Great. Thank you for these recommendations! I had not heard of a lot of these!! Always needing a new book to read by the pool! Thanks for sharing! I love reading. I definitely need to do more reading this summer. My favorite type of reading is mystery novels. I love trying to figure out who the bad guy is. Mary Higgins Clark is one of my favorite mystery novelists. Thank you!! I’m flying to Florida in a month and I totally need some good reads for the trip! I hadn’t heard of When Life Gives You Lululemons but that title definitely caught my interest! I’ll have to read it! excited to dig into these! I’ve heard many good things of the book When life gives you Lululemons. I can’t wait to put my hot paws on it. Thanks for recommending! I have so many of these on my list too! I can’t wait for When Life Gives You Lululemons and Still Me! Call me superficial, but I always choose the book by its covers. These look so colorful! It seems like a long time since I have read a book for pleasure but this list makes me want to change that. I am especially interested in When Life Gives You Lululemons. Thanks for sharing your list! This is so great! I may need to add some of these to my own list. The only Sophie Kinsella book that I read was Confessions of a Shopaholic. Might try the other books. I have such a hard time reading for fun because blogging takes up most of my time. Hopefully I can tackle something from my list this summer! I’m always trying to find books to read in the summer, thanks for the list! These are great selections! I’m more of a sci-fi geek myself and just started on a new trilogy which I am absolutely loving. I’d love to give that book about Michelle Obama a try though. I’ve heard great things about Other People’s Houses and I still need to read the last two after Me Before You. I’ve heard ‘When Life Gives You Lululemons’ is good! I want to read ‘Other People’s Houses’. These are great suggestions! I’ve been trying to read the same 3 books since January 1, so I don’t think I’m adding anything to my list yet LOL Maybe I’ll get them done this summer! Love reading a book that has more than one point of view. Will definitely have to check out that one and a few others on this list! Reading is something we should all try to make time for! I recently bought Other People’s Houses and I can’t wait to read it. 🙂 These other books look great too! Thanks for all the suggestions, I really want to start reading more often, so I’m going to need to add these to the list! Wished that I had a summer reading list. I used to read all day everyday. Then I got pregnant and it was really hard for me to stay focus on the words. Now with this little monster i barely have anytime for myself. Thanks so much for the recommendations. I’ve been looking for some good books to read! I need to add some to my list! An American Marriage broke my heart too!!!!! Such a roller coaster of a read. These seem like some really engaging titles. I would love to carve some time into my schedule this summer to read more. I hadn’t heard of any of these! Definitely checking them out.